An online version of the textbook is available (free-of-charge) here and a printed version is available at Wheelock Books. If you have a conflict with one of the midterms, please contact me as soon as possible so we can schedule a different testing time. The final exam time is set by the registrar and cannot be rescheduled. When we get closer to an exam date I will post a practice exam here. 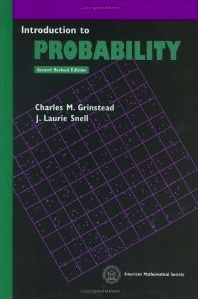 Probability is a subject that benefits greatly from computer simulation. With this in mind, the course will have a lab component. We will meet roughly every other week during X-hour to work through labs. You are allowed, and even encouraged, to work with other students on the homework problems, but you must write up your solutions independently and in your own words. You may also consult other people or sources other than the course text, your class notes, and the instructor when working on the problems. However, you are expected to understand the solutions you write. All exams are closed book, with no notes or calculators allowed. No help will be given or received. Students with disabilities enrolled in this course and who may need disability-related classroom accommodations are encouraged to make an appointment to see your instructor before the end of the second week of the term. All discussions will remain confidential, although the Student Accessibility Services office may be consulted to discuss appropriate implementation of any accommodation requested.